These peppers were reconstructed from the leftovers of this dish. They’ve been in the freezer for a couple of weeks, waiting to be pulled out, thawed and baked on a busy day like today. They were a big hit with both Boy and Girl. The Pesto-Polenta Loaf is left over from a party that my mother had this weekend. Apparently, it was a big hit with her guests, but she still had a bit left over. 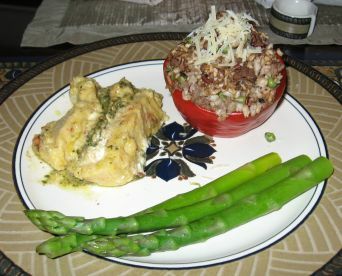 It was very messy, but very rich and yummy (a bit too rich for Boy and Girl, but Hubby and I loved it – thanks, Mom!). It has pesto, sun-dried tomatoes and bleu cheese in it. I need to get the recipe, but I think I will likely to try adapt it to be made in ramekins or muffin tins, so it’s not so complicated to unmold. The idea of pretty layers in a loaf pan is nice, but comes up short if it self-destructs upon unmolding. We LOVE guacamole around here. We dip chips in it, we put it in burritos, we slather in on sandwiches. We’ve even been known to occasionally dig in with a spoon, but you don’t need to tell anyone about that…..
Peel, pit and mash 2 of the avocados. 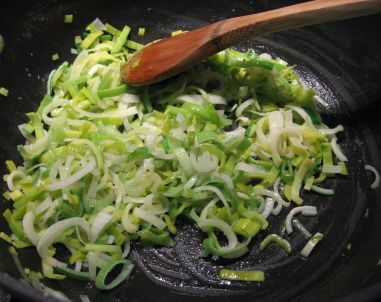 Peel, pit and coarsely chop the 3rd one. Gently fold in garlic, tomato, cilantro, salt, lime juice and half of olive oil. Pour into a serving bowl. 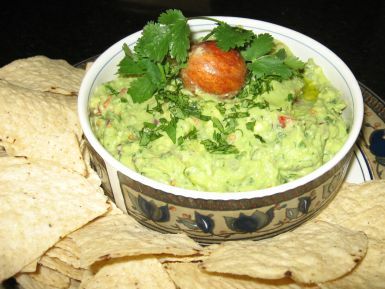 If preparing for later use, place one of the avocado pits in the bowl with the guacamole, and then cover TIGHTLY with plastic wrap, so that the wrap completely covers the surface of the guacamole, leaving no air space (guac is VERY perishable and will turn brown and yucky if exposed to air). Drizzle with remaining olive oil just before serving. You can vary this to your own taste, but you can’t omit the cilantro. There is NO SUCH THING as too much cilantro. If you must leave the cilantro out, for goodness’ sake, don’t tell ME about it! 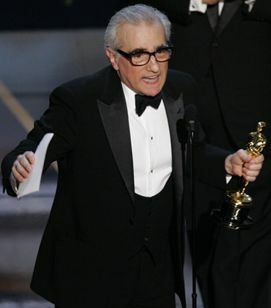 Wonderful congratulations to one of the most talented men on the planet. He should have won for Goodfellas, but he definitely deserves this. I made these for Girl’s End-of-Season basketball party today. Use any cupcake recipe that you choose (a mix is even fine). Prepare some buttercream icing. Tint about 90% of it orange. Spread that on the cupcakes in very neat circles (try not to go down the sides of the cupcakes). Add a tiny bit of melted and cooled chocolate (a small handful of chocolate chips) to the remaining 10% of the icing. 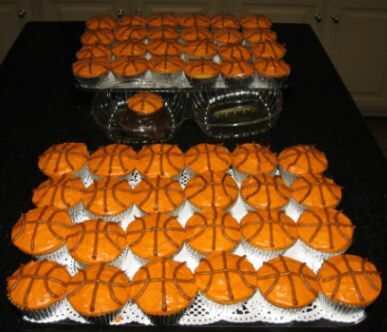 Put the chocolate icing in a pastry bag with a round tip (Wilton #5 or #6) or a heavy-duty ziploc bag with a tiny bit of one corner cut off and pipe it onto the orange frosting to make a basketball design. 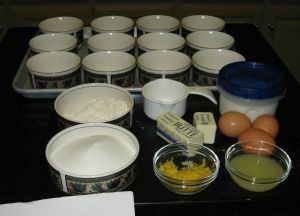 The recipe was adapted from a Betty Crocker “back of the box” recipe. If you’re serving this dessert for a dinner party, it is crucial to prepare your “mise en place” ahead of time. The puddings take a while to bake, once they’re prepared. You don’t want to have to be grating lemon peel and squeezing lemons while your guests are waiting for dessert. Cream butter and 3/4 cup of the sugar until light and fluffy. Blend in egg yolks, lemon juice and rind. Add flour; mix well. Stir in milk. Beat egg whites (separately) until soft peaks form. Gradually add remaining sugar, beating until stiff peaks fork. Fold into batter; pour into 6 ramekins (6 to 8 ounce size). Set custard cups in baking pan; pour in boiling water to 1/2 inch depth. Bake at 350 degrees for 35 to 40 minutes. The original recipe says to invert on a small plate and serve. 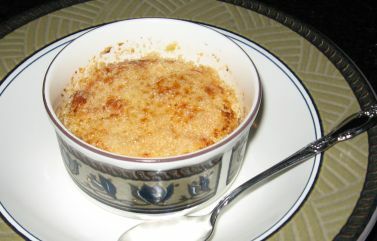 I prefer, instead, to sprinkle the superfine sugar, liberally and evenly, over the surface of each pudding (while it’s still in the ramekin) and then broil it lightly and evenly with a kitchen torch (a regular hardware-store blowtorch will work fine, too, if you buy a small adapter to go on the end) until the sugar has caramelized into a smooth, crunchy layer. In the past, I have used turbinado sugar, but I’ve decided that it’s too crunchy and I prefer the superfine, since it melts better into one, thin, smooth crunchy layer. Place the completed puddings (still in the ramekins) on a saucer, small plate or shallow bowl and serve. Warn your guests that the ramekins will be hot. These are very, very yummy. 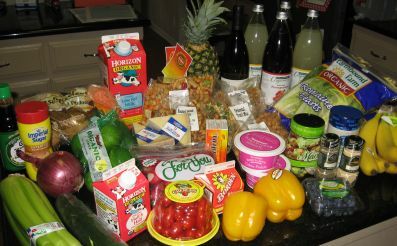 This is what $180 worth of groceries looks like in my neighborhood. I don’t buy flowers often, but we were having friends over for dinner and I thought they were pretty. The herbs were on sale, too, so I couldn’t resist those. 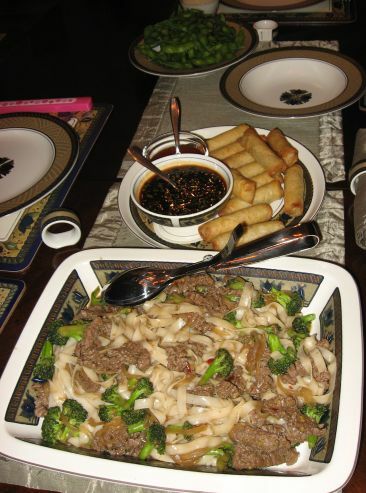 I have served this delicious (and REALLY easy) Beef-Broccoli Lo Mein recipe from Cooking Light magazine before and we have really enjoyed it. The beef takes on the ginger-garlic flavor nicely (even though it’s not marinated) and the sauce has the perfect balance of sweet and spicy. I substitute wide Udon noodles for the spaghetti for a little more authenticity. The only drawback to this recipe is that it calls for a lot of ingredients that most people do not routinely have on hand (oyster sauce, fresh ginger, Thai chile paste, etc.). Of course, around here, we ALWAYS have sriracha on hand. Hubby loves that stuff and put it on his breakfast casserole this morning. 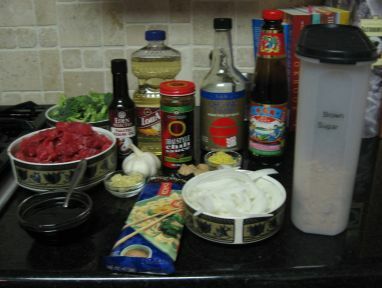 I don’t “Mise en place” for everything that I cook, but I do think that it is especially helpful for anything stir-fried. Hubby and I LOVE this sauce, but it’s a little too spicy for Boy and Girl; they usually use the “sweet and sour”-type dipping sauce that comes in the package of eggrolls. 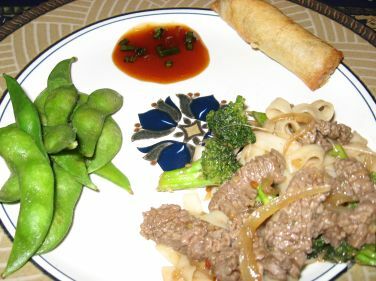 We also ate some in-the-shell edamame with this dinner. Cooking Light suggests that you serve fortune cookies (natch) for dessert. When I was a kid, my mother and I made fortune cookies from scratch once (I cannot, for the life of me, remember WHY), but I do remember that it tough to get the cookies stuffed with a fortune, folded in half and rolled around a wooden spoon in time before the cookies hardened into unflexibility. This has been a running joke with Hubby and me. I told him once MANY years ago, when we were finishing dinner and having fortune cookies at a Chinese restaurant, “My mom and I made fortune cookies from scratch once when I was little”, thinking that he would be terribly impressed. In typical understated Hubby fashion, he said “cool” and went about eating his cookie. When I told him of my disappointment, he corrected his reaction so appropriately “Wow – fortune cookies – really? 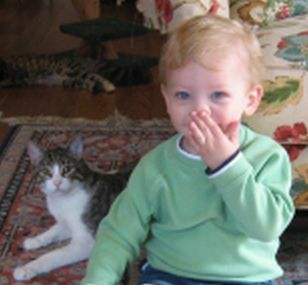 That’s great!” that I now remind him of my childhood Chinese baking pursuits EVERY time that we eat fortune cookies – so much so that he will now sometimes say, “Wow – fortune cookies – really?” when he sees the server coming with the check and cookies at the end of the meal. I was babysitting for my cousin’s adorable 2-year old son today, so didn’t get much cooking done, even though it’s a “holiday”. I did manage to find this totally cool doll-maker website, though. This is really fun. I might have to let Girl’s friends try it the next time they have a sleepover. I saw this recipe from www.chow.com, featured as part of a Valentine’s Love/Hate menu. It looked really good and the mom-in-law had fresh cauliflower and beets handy, so I thought I’d give it a try. Hubby was out of town for Valentine’s, so I ended up making this a little later, for my dad’s birthday. My grandparents were in town, too, so it was a multi-generational (4?) party. I forgot to take photos of the finished soup as it was being served, but it was quite lovely, with the colorful, crispy beets on top. 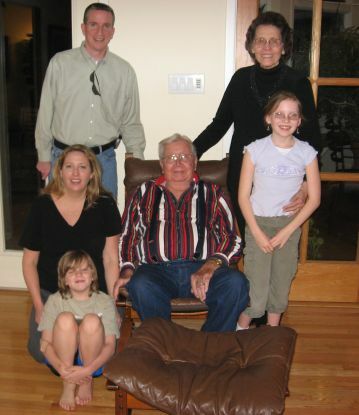 (I’ve posted a photo of Hubby, me, Boy, Girl and my grandparents at the birthday dinner, instead.) I only made one batch of soup, which is only supposed to serve 2, but there were 8 of us, so I served small, appetizer portions in ramekins, as an “amuse bouche” before my mom’s dinner of bruschetta, salad and lasagna. The soup was very yummy and creamy, especially for something so healthy. I did substitute chicken broth for the water, just to add a little more body. The parsnips gave a tangy, refreshing gingery flavor. 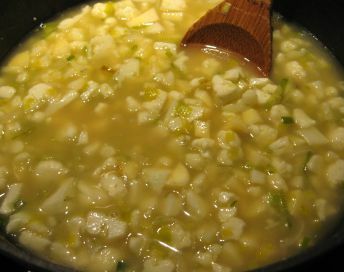 The soup, simmering, before being pureed. 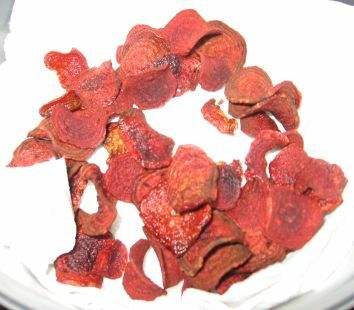 These beet chips were SO yummy. They would be tasty on top of a salad, instead of croutons. Sorry it’s been so long since I’ve given you any new recipes. It’s been an insane week and I haven’t been cooking much. Girl had a basketball tournament (3 games in one week), Hubby was out of town and we’re all still really tired and recovering from being sick. I did make some heart-shaped banana muffins for rhe kids for breakfast on Wednesday (also served them to basketball team, because it was my day to bring snack), but other than that and scrambled eggs at breakfast, the kitchen has been closed around here. Some friends invited us (minus Hubby, who was braving freezing weather in DC) to dinner on Valentine’s and served us GREAT Chicken Curry that I SHOULD have taken a photo of. It was DEEE-lish!